Angry protesters are seeking justice for Michael Brown—and much more. Police arrive to the scene of burning cars outside of Ferguson, Missouri (AP Photo/Charlie Riedel). Ferguson is on fire. Immediately after St. Louis prosecutor Robert McCulloch announced that a grand jury had failed to indict Police Officer Darren Wilson in the killing of Michael Brown, an unarmed black teenager, waves of unrest roiled the city. A dozen buildings were torched and looted, and two police cars were set ablaze. 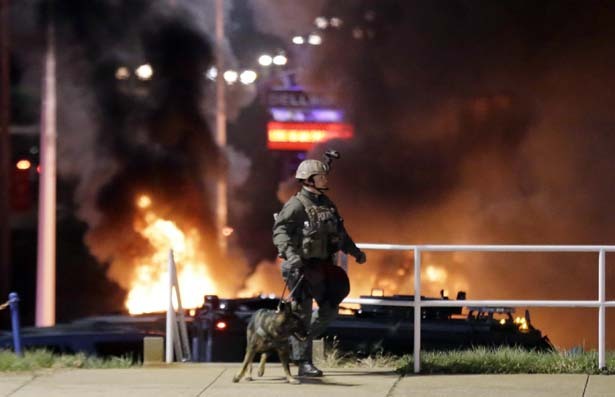 As President Obama appeared on TV urging calm, cops in Ferguson fired rounds of tear-gas canisters into crowds and deployed armored vehicles with gun turrets that were built for our wars in Afghanistan and Iraq. They eventually arrested sixty-one people. In cities across the country, Americans spontaneously took to the streets, shutting down highways and bridges in acts of civil disobedience. In New York City, one demonstrator splattered Police Commissioner Bill Bratton with fake blood. From the president on down, the official response to these protests has been to demand, in an impotent mantra, respect for the rule of law. So yes, let’s talk about that rule of law. To begin with, let’s talk about the near impunity with which law-enforcement agents in this country shoot, choke and beat unarmed civilians. This epidemic of lawful violence has become so routine that we lack even accurate statistics about it. By one count, on-duty police officers committed 3 percent of all homicides last year. A more expansive study by the Malcolm X Grassroots Movement found that in 2012, a black person was killed by a police officer, security guard or self-appointed vigilante every twenty-eight hours. As Chase Madar points out at TheNation.com, state and federal law gives wide latitude to police officers to use deadly force in self-defense, or merely in carrying out an arrest, if such force is “objectively reasonable.” In practice, that standard means police accounts are almost always taken as truth, even if eyewitness testimony or forensic evidence points to a different reality. And as recent cases remind us, when the suspect has dark skin, what counts as an “objectively reasonable” use of force by police may be prompted by a toy gun, a loose cigarette, the symptoms of mental illness, or a person simply walking into the darkened stairwell of his own building. This two-tiered system of justice—one for civilians, the other for law enforcement—must end. Let’s also talk about “broken windows” policing, the guiding principle in virtually every major city in America. The debate over stop-and-frisk in New York, in which more than 80 percent of those stopped were African-Americans or Latinos, exposed the racist underpinnings of such policies. Less known has been the fact that over-policing minor offenses isn’t just racist; it’s systematic extortion of the poor. In Ferguson, a town of 21,000 mostly African-American citizens, the city court issued more than 32,000 arrest warrants for nonviolent offenses in 2012, raking in court fees and fines from those too poor to mount a legal defense. As Radley Balko documented in a devastating Washington Post exposé, some municipalities in St. Louis County make 40 percent or more of their annual budget from the collection of fines for infractions as minor as playing loud music, disturbing the peace and, yes, even wearing saggy pants. And let’s talk, finally, about what all this over-policing ultimately produces: a historically unprecedented system of mass incarceration in which nearly half of all black men by age 23 will have been arrested, and in which 3,000 prisoners—65 percent of them black—currently languish in prison for life for nonviolent crimes. So yes, Ferguson is on fire. Black America, brown America, poor America is on fire. And these embers of rage will smolder and flare until our out-of-control “justice” system is thoroughly reformed.